Hello! It's been quite a while since I've posted anything other than Craft Project Central projects. The second half of November and through December I was working like crazy trying to finish up Christmas gifts for my family. I love to make a large number of my gifts and I have a pretty big family so that takes me away from the blog more. I hope this year to have at least worked ahead and scheduled posts that way I don't leave you hanging again. I recently got some lovely new goodies in from the Occasions Catalog a while ago and finally got the chance to play with some of them for fun last night. So this is what I whipped up. Super simple, not too many layers, but I so very much love the look! When I started on this card I really just wanted to play around with these two new stamp sets and this practically fell together after that. I started off with a 5-1/2" x 8-1/2" piece of Whisper White card stock and scored it at 4-1/4". Next I cut a piece of Pool Party card stock 4" x 5-1/4" and stamped the Hardwood background image onto the card stock in Coastal Cabana ink. I cut a piece of Whisper White organza ribbon 20" long, wrapped it around the panel and tied it into a bow. I adhered this panel onto the card front with some glue stick. 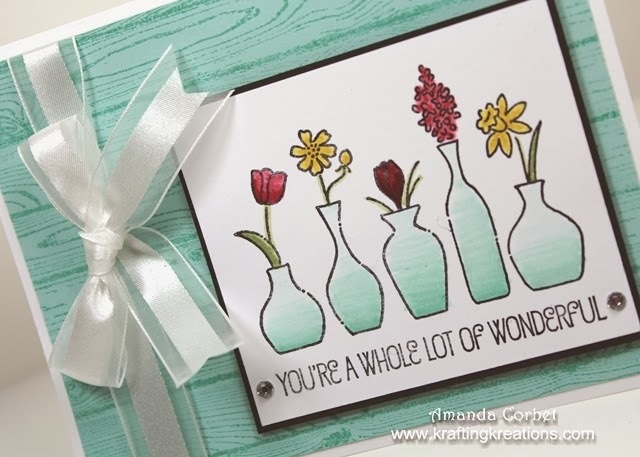 Next I cut a piece of Whisper White card stock 2-3/4" x 3-1/4" and stamped the Vivid Vases image onto the card stock in Black Stazon ink. To color in the vases I squeezed the middle of my closed Coastal Cabana ink pad then picked up some of the ink from the ink pad lid with my Blender Pen. I started coloring from the bottom of the vase and worked my way up which naturally produces the wonderful ombre look. For the flowers I colored them in with Daffodil Delight, Raspberry Ripple, Strawberry Slush, and Regal Rose markers. The leaves and stems were colored with Pear Pizzaz and shaded with Wild Wasabi. 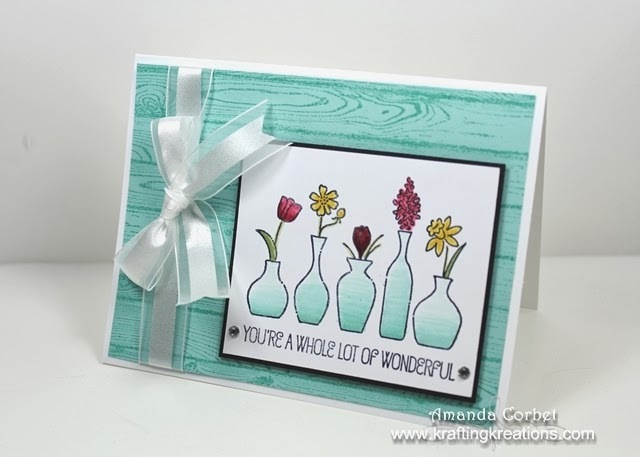 Once I finished up the coloring I adhered this panel onto a 2-7/8" x 3-3/8" piece of Basic Black card stock, added a couple Rhinestone jewels on either side of the greeting, then adhered this onto the card front with Stampin' Dimensionals. So easy! Well if you enjoy coloring like I do it's easy. Take a look at all the other fabulous goodies available in the new Occasions catalog by clicking HERE.